If anything is to be learned from Jamal Khashoggi’s murder is that moral relativism is a plague that has come to pollute not only the public debate but the very fabric of our psyche – and how we relate to one another as people. The premise so far has been one of exceptionalism and inflated ethnocentrism. By virtue of geography and the self-righteous assumption that the West knows not better, but best, our world has been translated through a dialectic of McCarthyism and political grandstanding. Whereas the public is expected to automatically exonerate certain parties of all guilt on the basis of their political alliances and economic stature, others – those labelled as ‘enemies’ are guilty by default of whatever crimes our western governments would and could ever wish to assign them. Russia and Iran, have, more than most across the decades, suffered under such rationale. Branded undesirables for they each stubbornly refuse to offer up their sovereignty to gain political favours, and thus assuage others’ hegemonic ambitions, those two nations offer an interesting window onto the formulation of today’s world politics. Beyond such blatant political hypocrisy lies another manipulation – maybe more nefarious still, as it directly plays into our ability to acquire knowledge, and by extension our ability to assert facts from fallacies and thus formulate opinions. Our media have de facto become a new frontline. More to the point our media are fast becoming a convenient proxy, or at least an alternative to direct military interventionism. Why spent military resources when one could taint nations’ right to exist through media slander and facts manipulations, and in doing so, weaken their standing both in the public arena and international scene? While belligerence has found new ‘softer’ expressions, its core motivations are not. Control remains very much the name of the game. To the pursuit of such control, nations have also learnt to leverage political opposition and armed dissidence as convenient pressure points against those they wish to bend to their will. I give you the recent attack carried out this September in Ahvaz , Iran, by Al-Ahwazi movement – a terror group whose agenda is to carve out Iran’s territorial sovereignty to establish its own. If such an attack does not exist outside the realm of the ‘expected’ it is what transpired afterwards that should give us pause. An Arab nationalist and separatist organisation, Al-Ahwazi movement has long found a welcoming ear in Saudi Arabia and to some extent Europe on the basis of its rejection of Tehran’s authority. The seat of Sunni-Arab power, which expression so far has been entrenched in sectarianism for a lack of better socio-political justification, Saudi Arabia has defined its very existence and claim to power in its calls for annihilation of Iran – and by a convenient game of religious exclusionism and ethnocentric association : the Shia world altogether. Riyadh’s support for so-called Arab nationalism only serves to reinforce its own hegemonic claim over the region by claiming a higher cause to its greed. Just like the MEK/MKO found a safe haven in several European countries – France and Albania in the lead, for it offers the appearance of a structured and legitimate opposition, terror groups such Al-Ahwazi movement have been played as agents of destabilisation to serve America’s call for regime change in Iran. A recent report by Arron Merat in the Guardian sheds a comprehensive light onto such western propensity to tolerate terrorism and armed dissidence when in alignment with its own hegemonic ambitions. Delisted as a terror organization by the UK in 2009 and then the United States in 2012, the MEK/MKO has since been used as both a weapon and a political argument against Tehran’s government on fallacious claims it holds popular legitimacy. At the annual “Free Iran” conference that the group stages in Paris each summer, dozens of elected US and UK representatives – along with retired politicians and military officials – openly call for the overthrow of the Islamic republic and the installation of Maryam Rajavi as the leader of Iran. At last year’s Paris rally, the Conservative MP David Amess announced that “regime change … is at long last within our grasp”. 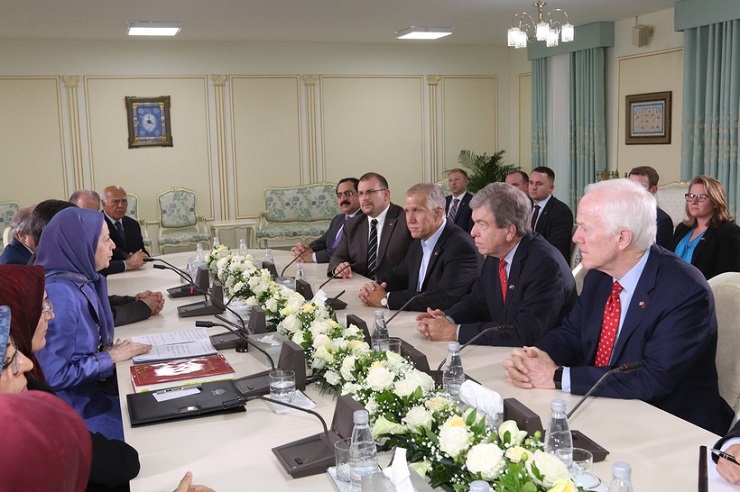 At the same event, Bolton – who championed war with Iran long before he joined the Trump administration – announced that he expected the MEK to be in power in Tehran before 2019. If we consider that Maryam Rajavi, the president of the MKO/MEK was appointed by her believed-to-be-dead husband to secure ideological continuity, it stands to reason to doubt, or at the very least question the ‘democratic’ aspirations of such a group – in particular since it continues to be linked to violence and tales of virulent repression against their detractors and even members. But back to Al-Ahwazi movement. On 22 September 2018, terrorists attacked a military parade in the southwestern city of Ahvaz, killing 25 and leaving scores injured including soldiers of the Islamic Revolutionary Guard Corps (IRGC) and civilian bystanders. A well-known terror group which activities stretch back to 1997, Al-Ahwazi movement has benefited from both European leniency and Saudi Arabia’s financial generosity by virtue of its agenda. There is something to be said to such political relativism if we consider with which verve one former US President decried Terror as the enemy all nations should rallied up against. The real questions are: whose terrorism and according to whose standards? While few will be surprised to learn that Saudi Arabia has been a friend to Terror, they might yet ponder over the kingdom’s role in architecting and directing Terror’s hand against Iran. In April 2018 , the Saudi state-run satellite channel al-Ekhbariya aired a short documentary that described al-Ahwaz as “under occupation by Persian forces”. The Saudi-owned al-Arabiya then published a commentary entitled Arab Ahwaz must be liberated from Iran in March. The op-ed was penned by Emirati businessman Khalaf Ahmad al-Habtoor. “Iran’s policy of ethnic discrimination combined with its Persian resettlement endeavours has resulted in turning the Ahwazi Arabs into an economic and social underclass,” Habtoor writes. Human rights groups have also recently expressed alarm at arrests of Ahwazi Arabs by Iranian security forces, conveniently omitting to specify that in matters of terrorism nations are entitled to exert due pressure. But this is not where the story stops. Claims have now been levelled against Iran for allegedly seeking to crackdown on Ahwazi members in Denmark – emphasis on allegedly, to deflect away from Saudi Arabia’s crimes and the criticism they have generated. Should you have missed it, public outrage must serve pre-determined political purposes, and not as we should expect higher principles. The manipulation here is double since it accuses Iran of crimes it not only never committed but never attempted to undertake, it also posits the assumption that Iran, by the nature of its system of governance, has no claim over its national security. Denmark accused in October Iranian agents of being behind a plot to assassinate an Arab separatist activists in the country. “It was an operation by the Iranian intelligence service which, we believe, was planning an attack in Denmark” against three Iranians suspected of belonging to the Arab Struggle Movement for the Liberation of Ahvaz, PET chief Finn Borch Andersen told reporters. “An Iranian intelligence agency has planned an assassination on Danish soil. This is completely unacceptable. In fact, the gravity of the matter is difficult to describe. That has been made crystal clear to the Iranian ambassador in Copenhagen today,” then added Danish Foreign Minister Anders Samuelsen. What Denmark conveniently failed to disclose was that such so-called ‘plot’ was unveiled by Israel right on the heel of mounting calls of sanctions against Saudi Arabia. The assumption that a country’s right to defend and assert both its sovereignty and territorial integrity is relative to its ability to draw international consensus is flawed, and very much a negation of the principle of national sovereignty.